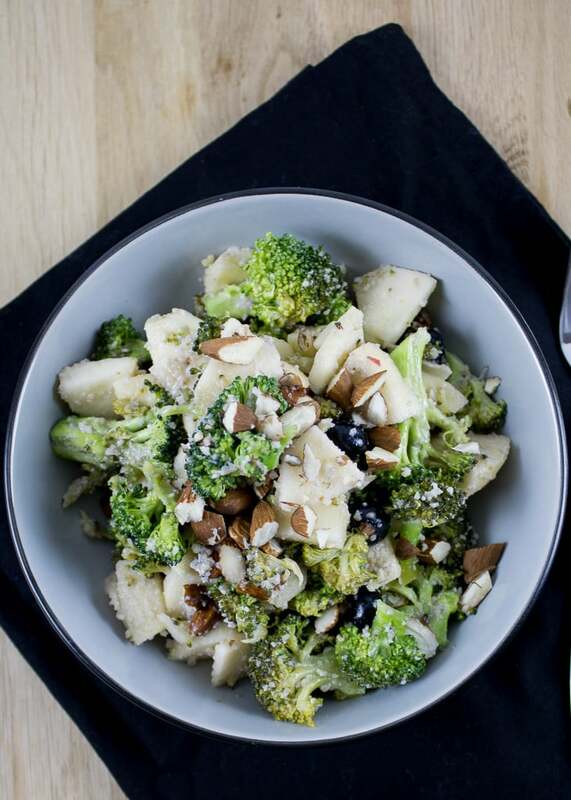 This wonderful salad with broccoli can be a great lunch at the office or a side dish to the main meal. You can make it in vegan version, if you don’t use honey but other sweetener in the dressing. The salad is fresh with creamy dressing which is absolutely delicious and we would never guess that it’s milk and lactose free. This dressing is on the base of raw soaked cashews which could be substituted by sunflower seeds too. 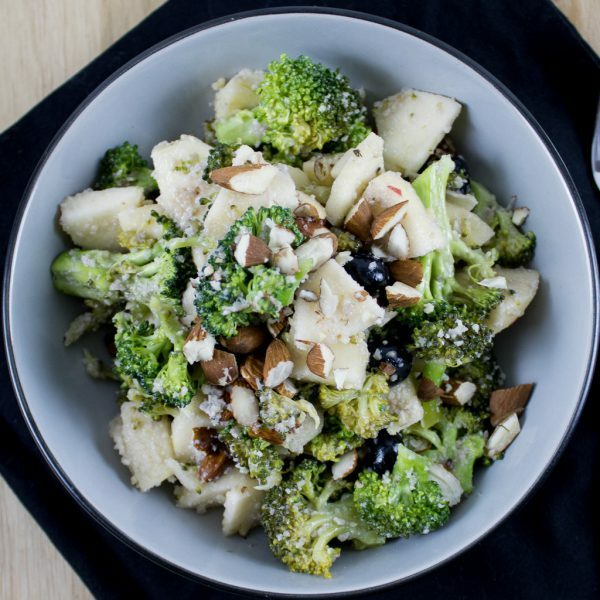 The salad includes steamed broccoli, fresh raw apple and dried fruit which can be replaced by fresh berries if you have some. That’s the perfect vegan salad to me and we make it really very often as it contains a lot of protein and it is very satisfying. You’re looking for ideas for vegan lunch or dinner?! 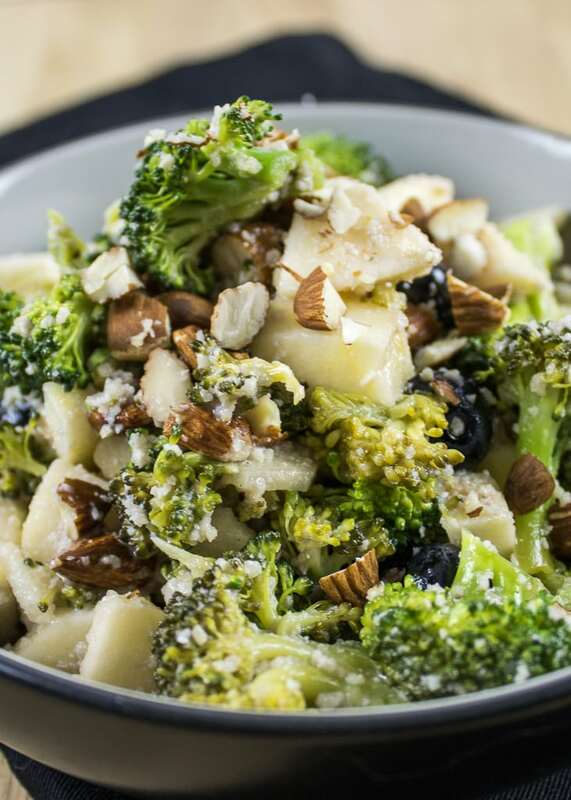 Try out this recipe of delicious, easy and healthy broccoli apple salad. This dressing is creamy and with interesting sweet and sour taste and perfectly combines with the apple and dried fruit. The salad is suitable plant based or vegan diet. Steam the broccoli for like 5-7 minutes. I don’t have a special appliance, so I use a big metal strainer in which I put the vegetables and put it over a pot with boiling water. I leave the broccoli to cool down. In a blender I put all ingredients for the dressing and mix them well until I get smooth creamy mixture. I peel and slice the apple and the onion, I add the blueberries, raisins or any other dried fruit or fruit I’ve chosen. Then I add the broccoli and the dressing and stir well.